Like much conceptual reappropriation, David’s reading from the blotter was interesting for the ways that it framed the Oakland police, whose history of corruption and violence are notorious, going back to the Black Panthers and other activist groups of the 60s and 70s. 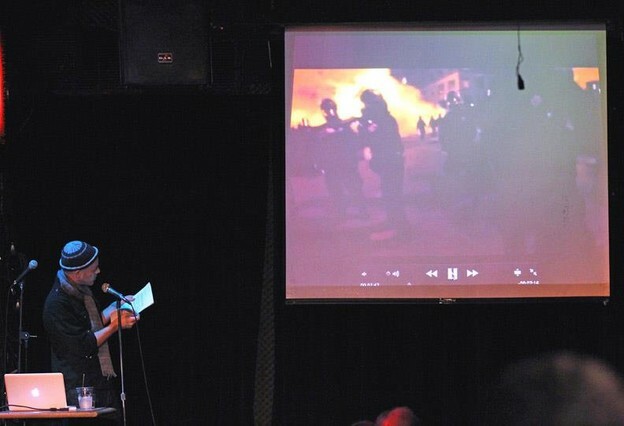 When David finished reading from the blotter, a video projection from his laptop was cued. As soon as the video came on and David started reading, one could hear resonances with the first text he had read. Only now he provided an image track giving this language context for the first time in the performance. The video was compiled from Livestream and cellphone footage of occupiers clashing with police. Often it was pixellated, a fact that David’s text described repeatedly, the pixellation enacting the withdrawal of the image’s representational power, abstracting an erstwhile documentary content. Most of all, for me, the pixellation embodied an affective content; it obscured events which could not easily be represented, and which instead demanded witness — specifically the body brutalized and made vulnerable, armorless before a phalanx of fully-armored cops. In other footage one saw an equally beautiful (and fairly abstract) image of a camera being dropped to the ground, pointing at the sky as it inadvertently recorded the silhouettes of police beating citizens with truncheons. In yet another video, a woman was flung onto pavement face first by police. David replayed these discrete videos in slow motion, synching them with his minute descriptions of movements and gestures depicted in the footage. As David also commented to me afterwards during an extensive conversation about his involvement in the Oakland occupation, where his performance may have seemed to attempt to reenact scenes from the occupation, it instead foregrounded the impossibility of successful reenactment, the bodies that produced its context being withdrawn from us, the social conditions that produced that context someplace other than what he read and the video he showed. It reminded me of something Adorno says in Aesthetic Theory, that we reenact what could not be felt the first time around. Through his use of bodily and textual constraint, and through tactical remediation and recontextualization, David touches an affective content that we might otherwise not feel through the representation of political and social traumas, traumas which for many have become deeply personal through their involvement with the occupy movement.